Update 2/20/2017: These Banana Chocolate Chip Pancakes are my families favorite pancakes! We have been making this exact recipe since 2014 — almost 4 years now — just about every Sunday for breakfast. We are big breakfast fans and I love any way to use up over ripe bananas. Ellie isn’t a fan of chocolate, but is thankfully a huge banana fan. I always set aside a little bowl of batter just for her, without chocolate chips, and this recipe makes perfect plain banana pancakes as well. Hope you enjoy eating them as much as we have over the years! Y’all didn’t actually think that I would stop making pancakes now that I learned the secret to French Toast, did ya? I just can’t help it, pancakes are my favorite! Jorge and I had plans to spend Sunday on the couch — doing nothing. With a long weekend, I like to pick at least one day to just lounge around and be bums. We stayed in our PJs all day and binge watched United States of Tara on Netflix. Around 11, our stomachs started growling and Jorge asked if I wanted to go out to brunch. I did, but I didn’t want to change out of my PJs…and I don’t think the other paying guests would have been happy to see us there in our pjs sipping mimosas. Instead I started prepping the ingredients for hoecakes, but Jorge came over and said he wanted something a little different. And if there is one flavor that will always make Jorge happy, it’s banana. I had these babies on the table in about 15 minutes – definitely faster than we could have gotten into our favorite brunch restaurant. It was definitely one of the best breakfasts we have had in a long time! In a small mixing bowl, whisk together flour, baking powder, cinnamon and salt. Set aside. In a large mixing bowl, beat mashed bananas, sugar, egg, vanilla extract, sour cream and vegetable oil together until smooth. Add flour mixture, alternating with milk and stir until combined. Fold in chocolate chips. Heat a non-stick skillet to medium heat. Using a 1/2 cup scoop, pour batter on to skillet. Once you start to see little bubbles form, flip and continue to cook until pancake is browned on each side. Continue until you have used all pancake batter. 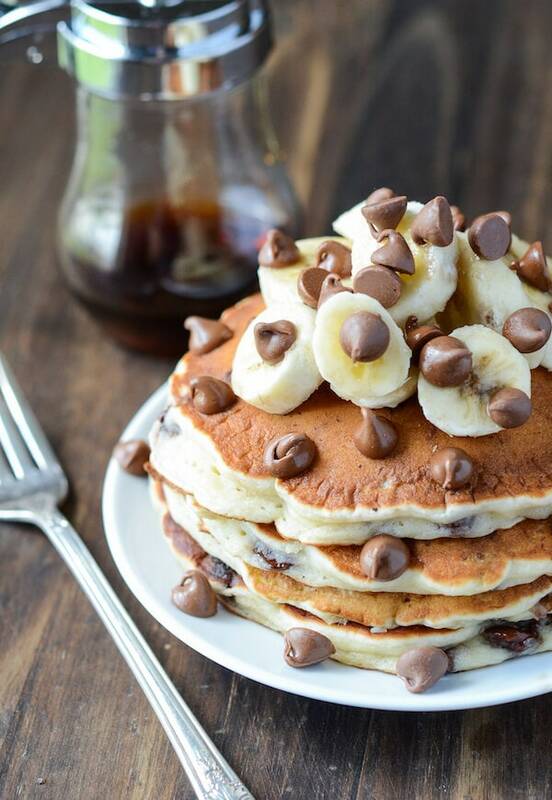 Serve pancakes with whatever you would like: butter, syrup or extra sliced bananas & chocolate chips! LOVE!! These are so awesome and a lot like my staple pancakes. See, my pancakes ALWAYS have chocolate chips in them. Always. It’s the way my mom did it growing up and I just love it! I like to throw in banana too when I have ripe ones and those always turn out to be my favorite!! Such an amazing stack and I think that extra sprinkle of chocolate chips is and awesome thing! My mom always makes these for me when I am home! Delish! Oh my goodness. I normally skip breakfast but if I can have these for breakfast, I’m so there! Pinned! And that french toast of yours. I see it pinned everywhere and it gets me, every.time. This would last about 10 seconds on our table, the kids go bonkers after banana and chocolate! These look so good. I have never made pancakes with sour cream. Can you substitute Greek yogurt instead or would that affect the texture of the pancake? I think it would be just fine to use plain greek yogurt instead! I love big, fluffy, pancakes and this is exactly that! LOVE this recipe Jess! I have been craving pancakes for days now and you’ve just pushed me over the edge! Love the combination of banana and chocolate. I need these in my life! I’m coming to YOUR house for breakfast!! These look so good! I grew up eating banana pancakes and somehow have gotten away from making them. Chocolate and banana is one of my favorite flavor combos! Thank you for introducing me to what I’ll be making for dinner tonight. 🙂 There’s nothing like breakfast for dinner! Yum! I eat nutella and banana sandwiches all the time. This is definitely my kind of breakfast! Love!! Well if there’s one flavor I can’t get enough of it’s chocolate! Especially for breakfast. I choose your pancakes over brunch out any day! 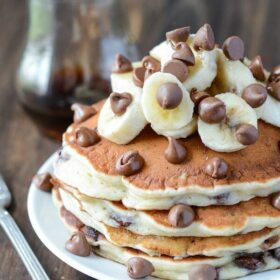 Banana chocolate chip pancakes are my favorite! Can’t wait to try these! I absolutely have to have a lazy day at home on the weekends as well, so glad that you stayed in and made these! 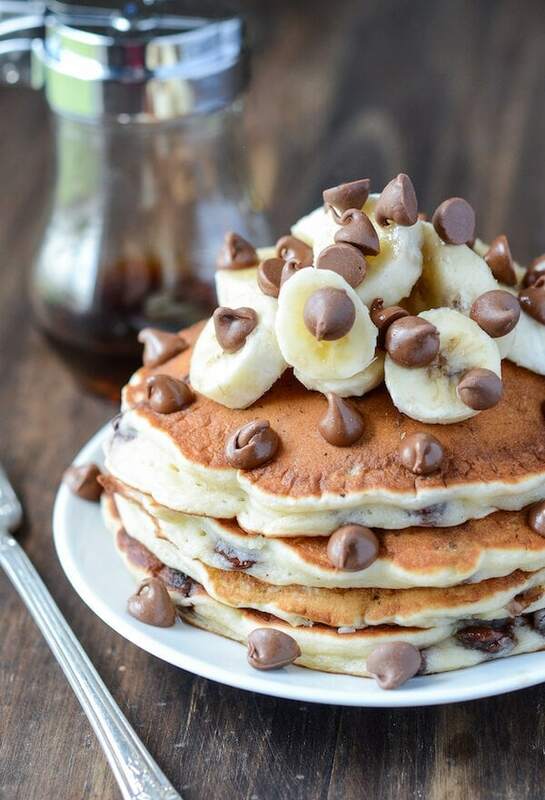 Banana + chocolate + pancakes = my kind of breakfast. I think it’s love… Me + these pancakes forevah! I’m a sucker for banana flavored anything, too! These look great! that first photo is heavenly! Is there a scratch & sniff? You know the way to my hearttttt!!! Those look so good!! Definitely adding them to a brunch menu soon. Wow these look so perfect 🙂 I can’t wait to make these for my husband when I get home! I love these! Beautiful photo too! saw your other pancake recipe, and they look identical except for the other recipe has more vanilla, more sugar, and uses buttermilk instead of sour cream/milk combo. so which version is better? I am thinking of using the other version using buttermilk, more sugar/vanilla, with the mashed bananas & chips? what is the difference in the pancakes between the 2 versions (buttermilk vs. sour cream/milk)? It’s really a personal preference type of thing…also depends on what I have on hand. I usually have sour cream, but I don’t always have buttermilk. Both ways are delicious – so just try which ever works for you! Made these this morning and they were a huge hit! Thanks for sharing. Can i leave out the sourcream? Can i leave out sourcream? Looks SO delish! Do you think this recipe would work for waffles, as well? Would I need to adjust anything? I think it would – but I am not 100% sure. If you try it, make sure and come back and share how it worked out!! These look absolutely amaaazing!! YUM! !